Cranes are traditionally used in the construction industry or where there is a need to move heavy items. Cranes use a pulley system to reduce the strain and increase the weight that can be moved. Some cranes have magnets rather than hooks to grab items and move them. A model crane can be built using simple craft items and supplies from around the home. This model can be built with either a magnet or hook. Lay two Popsicle sticks vertically on a flat surface. The sticks should be parallel and far enough apart to put a thread spool between them. Place one thread spool between the Popsicle sticks, so the ends of the Popsicle sticks are even with the outside of the spool of thread. Glue them in place. This will be the top of the arm of the crane. Cut the front off of the cereal box. Measure the Popsicle sticks from the previous step against the edge of the box, and cut two slits along the top, front edge. The crane will be inserted into these slits in a subsequent step. Insert a pencil into the center of the second thread spool. The pencil should fit snugly, so the spool turns when the pencil is turned. Add glue as necessary to firmly attach the pencil to the spool. Set the spool inside the box with the pencil ends extended over the sides of the box. 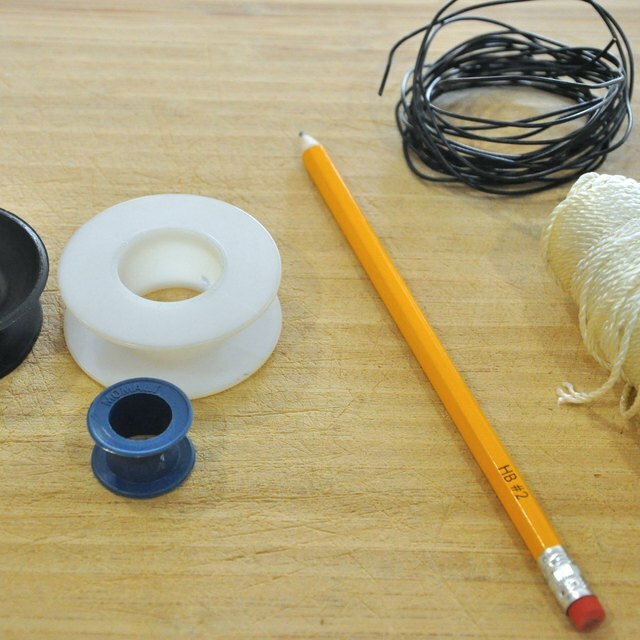 The spool should turn freely when the pencil is turned. Glue toothpicks across both Popsicle sticks in a ladder pattern. Repeat pattern on the opposite side, and glue in place. Set aside to dry completely. Once dry, insert the bottom of the sticks into the previously cut slits on the cereal box. Place the sticks at a 45-degree angle to the bottom of the box, and glue in place. Set aside to dry. Tie one end of the string to the thread spool attached to the pencil. Thread the string up through the arm of the crane and over the spool at the top. Tie the other end to a paper clip or button magnet to complete the crane. Turn the pencil to wind the "winch" of the crane and move the "load" at the other end. Cut a small "V" out of the cereal box where the pencil lies across the top to hold the winch more securely in place. Marcotte, Dawn. "How to Build a Crane for a School Project." Sciencing, https://sciencing.com/build-crane-school-project-5993565.html. 13 March 2018.